Cork's Patrick Cronin gets a shot away against Waterford. CORK SECURED THEIR second Munster SHL win in the space of four days as they finished well to beat Waterford by 11 points at Mallow on Wednesday night. Having beaten Kerry last Sunday, another win against Limerick this weekend should be enough to see Kieran Kingston’s side into the final, most likely against Clare. However, such an easy victory didn’t appear likely when Waterford eradicated a three-point half-time deficit as Tommy Ryan (two) and Shane Bennett pointed in the first 10 minutes of the second half. That made it 0-11 each but three Patrick Cronin frees steadied Cork once more and then sub William Leahy marked his introduction with a superb finish to the net after William Egan’s pass found him. That put Cork five ahead and they pushed on from there, with Cronin’s late goal putting a gloss on the win and giving him a personal tally of 1-8. In front of 588, conditions were difficult in the first half – though the Mallow pitch held up well, considering it had held a Dr Harty Cup tie earlier in the day. At times it was a free-taking contest between Cronin and Bennett, but Cork also had Luke O’Farrell doing well in attack and they were good value for their 0-11 to 0-8 half-time lead. Damien Cahalane should have augmented that with a goal chance in the first minute of the second half and then Waterford looked set to make a game of it but Cork had the stronger legs in the last 25 minutes. Scorers for Cork: Patrick Cronin 1-8 (0-6f, 0-1 65), William Leahy 1-1, Luke O’Farrell 0-3, Séamus Harnedy 0-2, Bill Cooper, Dean Brosnan, Stephen Moylan, Patrick O’Rourke 0-1 each. Scorers for Waterford: Shane Bennett 0-6 (0-4f, 0-1 65), Tommy Waring, Tommy Ryan 0-2 each, Shane O’Sullivan, Mikey Kearney, Andy Molumby 0-1 each. 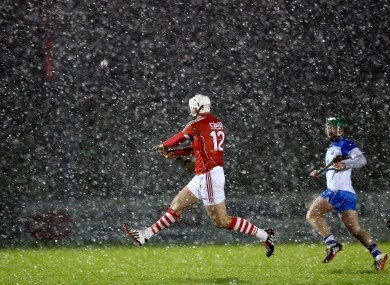 Email “Goals key in Cork victory against Waterford in the snow in Mallow tonight”. Feedback on “Goals key in Cork victory against Waterford in the snow in Mallow tonight”.